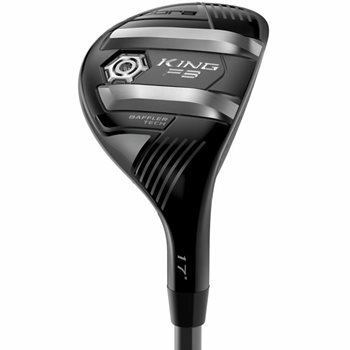 The Cobra King F8 hybrid has a high strength 455 stainless steel face that maximizes face flex for increased ball speeds and distance across all points of the face. The King F8 uses Cobra’s Baffler Rail Technology to provide improved versatility and forgiveness from any lie while Multi-directional Crown Aero technology improves drag reduction face-on through the downswing to generate maximum clubhead speed. A fixed, interchangeable weight positioned low and back results in a high, towering ball flight for maximum carry distance and forgiveness. Cobra Connect Powered by Arccos, allows you to track their performance to improve your game.